Which teams qualified for the UEL Last 16? The UEFA Europa League is one of the most prestigious football competitions in Europe, and it has been a real buzz this season. At the start of the campaign, the Europa League promised to be an exciting affair and it really was. Now, the round of 16 draw just recently concluded, and anticipation has started to build up over which team is up against which in the last 16 of the knockout stages. 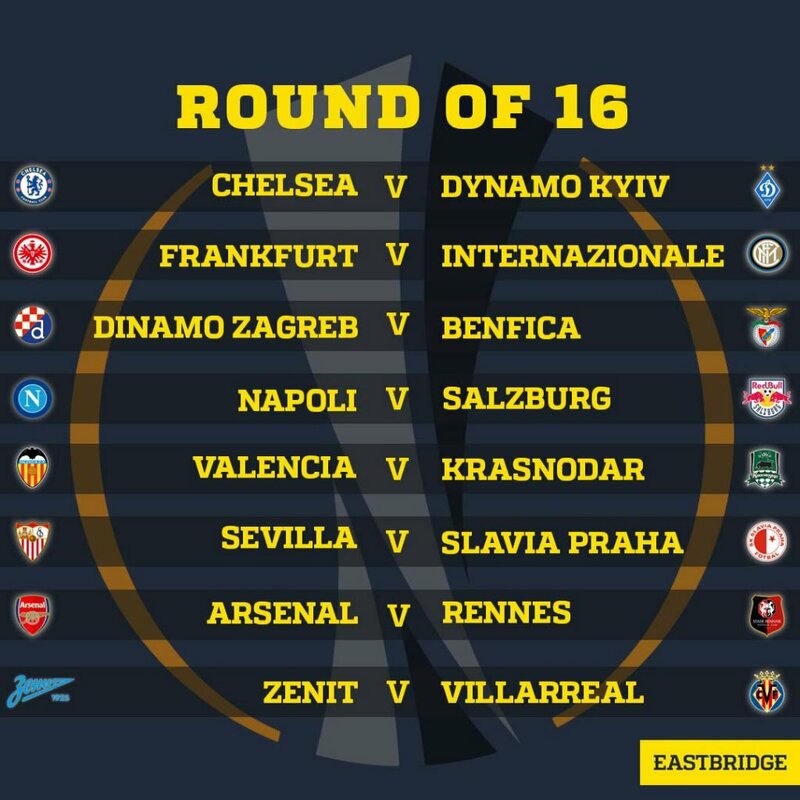 In this article, Eastbridge went over the list on who will be up against whom in the Europa League knockout rounds when the first leg begins on March 7. English Premier League side Chelsea have made an impressive performance in the Europa League despite having a poor form in the English top flight. The Blues will now face Ukrainian outfit Dynamo Kyiv in the last 16 of the Europa League knockout stages. These two teams have already been paired once before in the 2015-16 Champions League group stages, with a 0-0 draw in Kyiv and Chelsea winning 2-1 at Stamford Bridge. Eintracht Frankfurt have definitely been remarkable this season, being the league’s top-scoring team. However, their unbeaten run will be put to test when they take on Italian side and fellow former UEFA Cup victors Inter Milan in the last 16 draw of the Europa League knockout rounds. This will be the first ever UEFA encounter between these two teams. Dinamo Zagreb will continue their longest European campaign with an interesting matchup against Benfica for the last 16 draw of the Europa League. Benfica have played more matches in the competition than any other club in the league. Apart from this, they currently have an outstanding record not just in the Europa League but also in their domestic league as well. These two teams have faced each other just twice in UEFA competitions, and it’s always a thrilling matchup. Surely this time won’t be any different. Considered as one of the most attention-grabbing ties in round 16 draw, Napoli and Red Bull Salzburg will be meeting each other for the first time in this competition. These two European giants are yet again competing at this stage for the third time. Napoli displayed a remarkable performance both in this competition and in the Champions League, being the best third-placed team in the latter. Salzburg, on the other hand, is seated at the top of the Europa League Group B and in their domestic league. Spanish top flight side Valencia, who knocked out Celtic, has been drawn against Russian outfit FC Krasnodar in the round of 16. Krasnodar won the most home Europa League fixtures this season and has been unshakable at home so far this season. This match is crucial for Valencia so they would need to make the most of the first leg since they’re going to be the one with the home advantage. Sevilla, regarded as the most successful team in the Europa League with five title victories, will take on Czech Republic’s Slavia Praha in the round of 16. The Spanish outfit was able to get the better of Slavia Praha in two previous Europa League fixtures during the group stages in season 2007-2008. Once again, the Andalusians are looking good ahead of their clash against the Czech side. Premier League side Arsenal, who are among the favourites to come out victorious in the competition, are set to play Ligue 1 team Stade Rennais in the Europa League round of 16 tie. The Gunners were able to advantage from the round of 32 when they won against BATE Borisov on a 3-1 aggregated victory. Villarreal will travel to Russia to take on Zenit for their Europa League round of 16 tie. These two teams are in opposite sides of the spectrum. The Russian side is currently topping their domestic league standings, while the Spanish side is struggling in their respective league. Zenit will be entering this match against Villarreal fresh off the back of a 3-2 aggregated win against Istanbul side Fenerbahce in the round of 32 draw. Who do you think will claim come out victorious in the first leg of the Europa League knockout stages? Place your Asian handicap bets with our partner VOdds now and never miss out on the best odds and prices in the market!